Wouldn’t it be great to look as youthful as you feel? For some of us, age is really just a number. 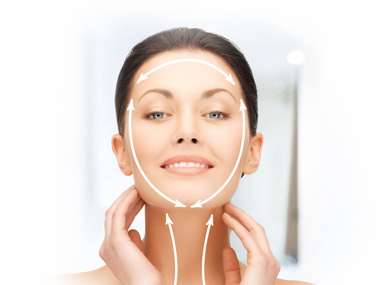 With the increasing popularity of non surgical face lift and minimally invasive skin tightening treatments, your face doesn’t have to look your actual age nor does it have to go the way of gravity even as you celebrate that milestone birthday. When hormones slow down production as you approach 40, it also signals the downturn of collagen production and the start of gradual loss of muscle and bone mass. All of these combined can lead to loss of structure that supports your soft tissues, which eventually leads to an overall ‘dropping’ appearance – the eyebrows droop, the smile lines deepen, and the jawline slacks. To rejuvenate the entire face, a combination of lifting and skin tightening procedures often achieves the desired results than just one type of treatment alone. This is because carefully chosen treatments work synergistically by combining different mechanisms to treat different problems. To better understand which combination of treatments will best address your concerns, consider the following options. Do you notice that your entire face – and not just random places in your forehead and cheeks – is going all the way south? If so, a non surgical thread lift may be more suitable. With this treatment, your entire face is lifted using absorbable threads inserted in strategic locations. Surgeons have long been using these threads, so they have a proven record of safety and biocompatibility. Polylactic acid (PLA) and polydioxanone (PDO) sutures are currently two of the more popular dissolvable thread lift. Silhouette Soft is an example of PLA thread lift that uses bidirectional absorbable thread cones that create immediate lifting. After inserting the sutures at a depth of about 5mm under the skin, the doctor may compress the tissue to give more definition to a facial feature or sculpt the entire face, adjusting the sutures as necessary. The result is a more toned, shapelier face with more definition. As the threads gradually dissolve, new collagen is produced, leaving the treated area firmer and less wrinkled. Cutis PDO (Polydioxanone) thread lift, on the other hand, employs a wider range of threads that are used for a variety of concerns. This means that if you have certain areas of saggy skin that PLA threads cannot address, you can get PDO threads to do the job. If you are looking to smooth out wrinkling in your eye area, thin, monofilament PDO threads are more appropriate. To lift the midface, thicker, bidirectional 360 degree cog threads are inserted into the SMAS (superficial muscular aponeurotic system) to achieve strong lifting and skin firming. The real results are seen in six to eight months, when PDO threads are absorbed by the body, thus stimulating production of new collagen. The lifting effect usually lasts 18 to 24 months. PDO thread lift for nose has also been proven as safe and effective, allowing patients to achieve a higher nose bridge without surgery. Non-invasive dermal heating, which jumpstarts production of fresh collagen, can be achieved through the use of safe, infrared light. Infrared energy reaches the deep dermis, causing collagen to contract during the treatment (leading to some noticeable improvement after the procedure), and creating new collagen over a period of three to six months. Over that period, skin tone improvement can be observed in treated areas such as the jawline, chin, neck and stomach. Titan is an FDA-approved infrared device for tissue-heating, making it an ideal tool for face lifting and sagging skin treatment. Ultrasound energy is familiar for its use in imaging. With this capability giving doctors an accurate picture of where to deposit the energy, ultrasound therapy has been used as a non invasive alternative to a facelift without surgery. This is because ultrasound penetrates into the skin’s foundational layer, the layer which cosmetic surgery works on. To achieve this, the handpiece bypasses the surface of the skin to deliver focused energy at the right depth under the skin using the right temperature. In response, the body produces fresh, new collagen over a period of two to three months when significant lifting effects can be observed. Currently, Ulthera (also known as Ultherapy) is the only European CE-marked and US FDA-approved non-invasive lifting procedure using ultrasound energy to tone and lift sagging skin of the brows, face and jowls down to the chest. When your concern is not just skin laxity but lost volume, hyaluronic acid dermal fillers do a better job at recreating the youthful contours of your face while giving it a gentle lift. Hyaluronic acid is naturally found in the eyes, skin and joints, so they are fully absorbed by the body, after which they stimulate the long-term production of fresh collagen to maintain the firmness of the skin. Because fillers are great for face contouring, they are often used not just to minimize nasolabial folds but also to improve eyebags, minimize dark undereye circles, and give the skin subtle lifting for a more rejuvenated and youthful appearance. Hyaluronic acid is firm yet moldable, so it’s also used as nose fillers to raise the bridge of the nose, smooth out ‘humps’ and ‘saddles,’ and define the nose tip for a sharper look. Take advantage of the many anti aging treatments that aesthetic clinic Singapore patients have access to – your skin doesn’t have to be at the mercy of natural aging and the elements. Read our blog to learn which combination of skin tightening treatments will leave you looking as fresh and young as you feel.